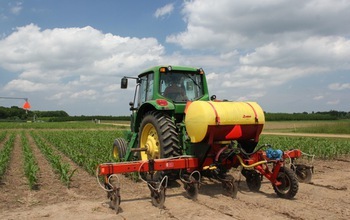 Applying nitrogen fertilizer to corn at the NSF Kellogg Biological Station LTER site. The following is part fifteen in a series on the National Science Foundation’s Long-Term Ecological Research (LTER) Network. Visit parts one, two, three, four, five, six, seven, eight, nine,ten, eleven, twelve, thirteen, and fourteen. Helping farmers around the globe apply more precise amounts of fertilizer nitrogen can combat climate change. That’s the conclusion of a study published this week in the journal Proceedings of the National Academy of Sciences. In the paper, researchers at Michigan State University (MSU) provide an improved prediction of nitrogen fertilizer’s contribution to greenhouse gas emissions from agricultural fields. The study uses data from around the world to show that emissions of nitrous oxide (N2O), a greenhouse gas produced in soil following nitrogen addition, rise faster than previously expected when fertilizer rates exceed crop needs. Nitrogen-based fertilizers spur greenhouse gas emissions by stimulating microbes in the soil to produce more nitrous oxide. Nitrous oxide is the third most important greenhouse gas, behind carbon dioxide and methane. Agriculture accounts for about 80 percent of human-caused nitrous oxide emissions worldwide, which have increased substantially in recent years due to increased nitrogen fertilizer use. "Our motivation is to learn where to best target agricultural efforts to slow global warming," says MSU scientist Phil Robertson. Robertson is also director of the National Science Foundation (NSF) Kellogg Biological Station Long-term Ecological Research (LTER) site, one of 25 such NSF LTER sites around the globe, and senior author of the paper. "Agriculture accounts for 8 to 14 percent of all greenhouse gas production globally. We’re showing how farmers can help reduce this number by applying nitrogen fertilizer more precisely." The production of nitrous oxide can be greatly reduced if the amount of fertilizer needed by crops is exactly the amount that’s applied to farmers’ fields. When plants’ nitrogen needs are matched with the nitrogen that’s supplied, fertilizer has substantially less effect on greenhouse gas emissions, Robertson says. "These results vastly improve the ability of research to inform climate change, food security and the economic health of the world’s farmers," says Saran Twombly, a program director in NSF’s Division of Environmental Biology, which funded the research through the LTER Program. Lead author and MSU researcher Iurii Shcherbak notes that the research is especially applicable to fertilizer practices in under-fertilized areas such as sub-Saharan Africa. "Because nitrous oxide emissions won’t be accelerated by fertilizers until crops’ nitrogen needs are met, more nitrogen fertilizer can be added to under-fertilized crops without much affecting emissions," says Shcherbak. Adding less nitrogen to over-fertilized crops elsewhere, however, would deliver major reductions to greenhouse gas emissions in those regions. The study provides support for expanding the use of carbon credits to pay farmers for better fertilizer management and offers a framework for using this credit system around the world. Carbon credits for fertilizer management are now available to U.S. corn farmers, says Robertson. The research was also funded by MSU, the U.S. Department of Energy’s Great Lakes Bioenergy Research Center and the Electric Power Research Institute. Dean Cooper2017-01-17T09:21:59+00:00June 16th, 2014|News|Comments Off on How much fertilizer is too much for Earth’s climate?